Bricktober was a resounding success last weekend! Lots of exciting and inspiring Lego displays were up for the public to view, made by some great local builders, who were displaying their Lego for the first time. 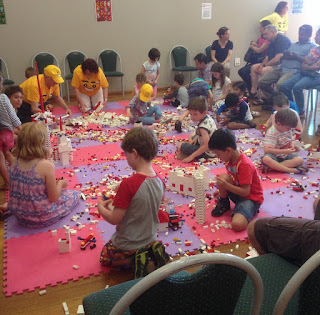 The kids loved looking at the exhibits, participating in the building competitions and playing around in the Lego playpit. There was plenty of Lego sets and minifigures for sale and Bricktober merchandise - caps, T-shirts and badges. Mr Bricktober was there, along with Darth Vader, a few Stormtroopers from the 501st Legion, and Anna and Elsa from Frozen, meeting and greeting the visitors. Many thanks to Stephen and Joanna Kendall for organising Bricktober, and cheers to the volunteers, Rotary Club and fellow exhibitors all contributing to make it all worthwhile. We can now start thinking about Bricktober 2016!